​Why settle for a boring shower experience when you can easily add a luxurious, spa-like experience to every shower you take? A rain shower head provides a drenching “rain” style of water flow over your entire body, instead of the typical shower spray that we have all grown accustomed to. This style of shower is typically reserved for high end hotels and spas, but it is actually really simple to install at your own home. We walk through the best rain shower heads on the market, along with providing a variety of options to combine a rain unit with a traditional shower head in your home. We’ll also highlight all of the features you should consider in a rainfall shower unit. ​When you are looking for the best rain shower head for your home, there are a few different types and styles that you can choose from. Take a look at some of the best rain shower heads to see what would be the perfect way to upgrade your shower. Small but mighty, the ​ShowerMaxx Premium Shower Head gives you a comfortable yet deeply invigorating clean. This 6” diameter rain shower head has 90 precision engineered high pressure jets. The output from this shower is 2.5 gallons per minute, which is about the standard for most shower heads. The silicon jet nozzles are self cleaning and do not allow lime and mineral buildup to occur. If you aren’t initially happy with the water flow allowance, then you are able to take the shower head off and remove the water flow restrictor. This will stop the shower head from regulating how much water flows out of it at one time. ​It is recommended that you begin using your new shower head with the water flow restrictor. Mainly because it is there to help reduce your water output. If you can shower happily with less of an output then that is better overall, instead of going directly to the max output when the flow restrictor is removed. The flow regulator, when in place also helps with low pressure water lines, regulating the flow so that it doesn’t feel like your water isn’t strong enough to flow properly out of the shower head. ​There is also an adjustable ball joint built into the head. This allows you to tilt and rotate the rain shower head as needed so that you can enjoy it flowing from an angle or experience the fully submersive rain shower experience when it is at a 90 degree angle. In the box is only the shower head, which is easy to install without a plumber or additional tools. Due to the smaller size you can place this shower head on a regular tilter shower arm, or purchase a more 90 degree directed shower arm. It would also fit well in a bathtub shower, since it has a smaller and more directed spray, similar to that of a standard shower head. You can purchase this rain shower head in a variety of colors such as chrome, brushed nickel, brass and oil-rubbed bronze. The multiple color options are all easy to clean and upkeep due to the durable finish designs. This shower head comes with a Peace of Mind Lifetime Warranty from ShowerMaxx. This means that you are able to reach out to their customer support at any time to have your shower head replace or repaired if anything happens to it. You can also return the shower head if you are dissatisfied with the product after a few uses. If you want the rain fall shower experience, but don’t want to lose the massaging and rejuvenating pressure, then this is the perfect shower head for you. ​Because of the stronger water pressure it can feel more like a waterfall than the gentle fall of rain, so if you are looking for something a little softer and more soothing than this may not be the best choice for you. ​A powerful and customizable combo, ​catered to your desires. When you are searching for the best rain shower head for low water pressure, the ​SR Sun Rise Luxury Shower Head is the perfect choice. It mounts easily onto your wall or ceiling where your original shower head is. It is a thin shower head by design, but it very sturdily made. This rain shower head has a ten layer chrome finish that offers a sleek look while giving it a strong durability. The ten layers make this shower head corrosion resistant and add to it’s long term life. This mirror-like chrome finish will also keep your shower head looking like new after years of use. If it needs a cleaning touch up, then you can use a natural cleaner like white vinegar and baking soda. This shower head is ideal for low water pressure homes because it has an air injection technology that moderates the water output. This type of water pressure maintaining technology will keep your rain shower consistent even in low water pressure homes. ​While you are receiving a consistent water flow, you are also saving 30% more water during your shower. This is because the SR Run Rise Luxury shower head keeps the water flow regulated to a slower 2.5 gallon per minute flow rate. ​Silicone nozzles in the shower head make cleaning a breeze while maintaining their shape and color so that your shower doesn’t look aged. The silicon gel nozzles will also ensure that there is no lime or mineral buildup in your shower head. ​Lime and mineral buildup is a common problem with homes that have hard water and can possibly reduce your showerhead’s output. The rain shower head is able to be pivoted from the mounted shower arm. So that you can choose a direct downward rainfall shower experience or angle it forward more to resemble a normal shower head. Out of the box, there is no additional shower arm for the rain shower head to connect to. If you do not already have a shower arm that is extended and points down at a 90 degree angle which is preferable for a rain shower head then you will need to purchase an additional shower arm. No additional tools are needed to install the rain shower head. However, you may need a pair of pliers or a wrench along with some plumbers tape, just to make sure that your new shower head is tight and free from any possible leaking. ​This shower head comes with a 5 year warranty. This way you can enjoy your showers comfortably knowing that your new shower head is covered from any possible defects. ​A low pressure fix for your high powered needs. ​It can seem like an impossible compromise to find a rain shower head that is also a more eco friendly water saving option. However, the German company Hansgrohe has created a modern and luxurious looking rainfall shower head that will put out less gallons per minute, allowing you to save water and potentially the planet. The ​Hansgrohe Raindance Select E 300 Shower Head has a flow rate of only 2.0 gallons per minute, which is .5 less than most shower heads. While it does offer a reduced flow rate, you won’t know the difference thanks to the AIR drop technology. The built in AIR technology mixes air into the water droplets. This allows for less water to flow, while you still feel like you are under a constant falling water flow. ​There is also a very conveniently located button on the shower head itself that allows you to switch from a gentle flow to a more powerful rinsing water flow. This button called “Select” is located in the middle of the shower head, so you can simply reach straight up and press it when you want to switch shower pressure. 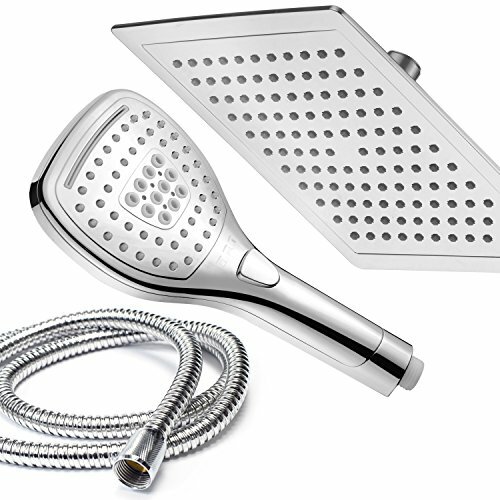 The shower head itself offers an 11.75” shower head that has 146 no-clog spray channels. These flexible silicone nozzles are easy to wipe clean so that you don’t have to worry about less of a water output due to mineral or lime buildup. While this shower head is more of a rectangle instead of the traditional square or circle rain shower head, it is still large enough for you to stand under and be completely covered by the rain-shower above. It also goes a step further allowing you to get a really deep cleaning for your new shower head. The spray face plate is removable so that you can clean out any hard water buildup that is on the inside. For your eco-friendly shower head you can choose between a Chrome, White Chrome or a Brushed Nickel finish for this rain shower head. If you are really wanting to turn your bathroom and home into a more eco-friendly place then you should learn more about a composting toilet and how it could fit into your life-style. ​Hansgrohe offers a 5 year warranty on this shower head that covers any malfunctions and most all of the parts. ​The ultimate compromise on feel and water conservation. ​Get the best of both worlds when you choose the ​DreamSpa Ultra-Luxury 9" Rainfall Shower Head​. This two in one combo features a generous 9” square rainfall shower along with a 4.75” handheld that offers multiple water flow patterns. The main shower head offers a luxurious rainfall experience. The extra large shower head has an all chrome finish. It also has an angle adjustable brass ball joint so that you can angle your rain shower head if you prefer. While this is already one of the best rain shower heads with a handheld, it also boasts an incredible feature for the rain shower head to handheld switching. Instead of having to reach up and toggle with a water alternating dial, you simply press a button located on the handheld. This allows you to grab the handheld, press the button with the same hand holding it and automatically have the water diverted from the main shower head, down to your handheld for a more direct rinsing. The hand held attachment can give you a high powered rain flow, an aeration massage flow or a luxurious waterfall combination flow. The water settings can be changed by pressing a button located on the handheld, instead of needing to turn and click a dial. ​This shower head is really easy to clean and maintain. Silicon water jets on the main shower head and handheld are able to be simply wiped to clean away any mineral buildup. The chrome finish doesn’t require any special chemicals to clean, you can use soap and water, or opt to spray it down with a natural white vinegar and Dawn dish soap cleaning mix. ​In the box is the rain shower head, the handheld shower head and a handheld attachment hose. If you do not already have a shower arm that hangs the shower head away from the wall and down at a 90 degree angle, then you may want in invest in one for the full rainfall shower experience. There is also a low reach angle-adjustable hand shower wall bracket that is included. This part will allow you to position your handheld shower head at an angle anywhere on your shower wall or bathtub surface with it’s powerful suction cup or and included adhesive bracket. Installation is really simple for this shower head combination. You should be able to connect all the parts to your shower in just a few minutes without any additional tools, unless you want to use a pair of pliers to make sure it’s tight. This rain shower head with handheld also comes with a limited lifetime warranty. The company offers an instant hassle-free return or exchange policy if you are not 100% satisfied with your new shower head. ​So you can take a chance and try out this highly rated rainfall shower head for yourself. There are plenty of rain shower head reviews listed on Amazon to back it up. ​A highly rated convertible rainfall shower head for a reason. ​When it comes to the best all over spa like experience from your rain shower head, the DreamSpa Ultra-Luxury 9” Rainfall Shower Head takes the cake. If you want our final vote, the DreamSpa Ultra-Luxury Rainfall Shower Head wins for Best Overall Rain Shower Head. With the two in one shower head and handheld combo, this duo earns the best rain shower head with high pressure vote. It is also the best overall choice for your stand up shower since it offers a large rainfall shower head and an additional handheld to make your morning routine easier. ​For these reasons, this shower head from DreamSpa wins the best rated rain shower head on our list. ​When it comes to picking out what the best rain shower head for your home is, there are a few features that you should take a few moments to consider. This will give you a better overall idea of what you should be looking for. ​When it comes to picking a rain shower head, you are not just looking for luxury, but also a shower head that is going to work efficiently in your home. ​Most all rain shower heads are excellent at lowering your water bill. While they may seem like more of a water hemorrhaging shower head, the rain fall effect is actually a much slower water flowing process. Most of the rain shower heads on the market offer a built in air flow technology that mixes air into each of the droplets, making them larger and heavier feeling as they fall down, giving you the feeling that you are immersed in a high flow rain shower, while it maintains a lower gallon per minute flow rate than average shower heads. When you are using less water, your hot water will last longer, since you aren’t using the full heated water tank in the same amount of time due to the slower water flow. This heat extending feature alone will give you longer and more relaxing showers. ​It is hard to realize the many benefits of na additional handheld shower head attachment until you don’t have one around to use. A handheld shower head makes cleaning easier, since you can pick it up and reach all the corners and walls of a shower to rinse away any grime or leftover cleaner. Having an attached handheld is great for being able to sit and still feel the comfort and warmth of a continued water flow. A lot of stand up showers offer a bench or have room for one. However, the placement of the bench or seat is never near enough to the main shower head’s flowing radius. ​A handheld is also great for using on pets when they need a wash or on your little ones to gently rinse them off after an extra bubbly baths. ​Installing a rain shower head is a great way to turn your shower into a more modern and spa like experience. There is a little bit of a hindrance that can occur though, if you have an older bathroom that won’t support it in functionality nor match it in the sophisticated styling. ​​A rainfall shower head is meant to be installed high enough that you are able to stand underneath of it in order to be fully submerged. Low ceilings won’t work as well since the shower head isn’t ideal to be mounted the same way as standard shower heads. Ideally you will need a higher ceiling so that the shower head has plenty of room to be mounted above your head. If you and everyone else in the household is short, then you may be able to get away with having a rain shower head mounted in a low ceiling area. Just don’t invite any taller people over for a shower. ​This type of rain cascading shower head is not exactly ideal for a bathtub/shower installation. This is because a rain shower head is wider and will have a larger radius of water flowing from the shower head. If you want to install a rain shower head then you really should have it installed in a larger and fully enclosed stand up shower. That way you don’t have to worry about overspray escaping and flooding your bathroom floor. There are smaller radius rain shower heads available that are more of a hybrid between a rain shower head and a standard angled shower head that you can use if you are limited to a bathtub shower area. This will allow you to have the luxury of a rainfall shower without the risk of water escaping. ​If you have the proper setting for a rain shower head, yet your entire bathroom seems to dated to support it, then you can try out some tips to make your bathroom more elegant without having to do any big renovations. When it comes to modernizing a dated bathroom, you really want to focus more on simple and less on anything loud like patterns or too bright colors. You also want to make sure that all of your bathroom hardware matches. This is a small detail that can make or break a bathroom’s atmosphere. ​Rain shower heads can come in a variety of sizes and shapes. You can get a shower head that is as small as 6” or invest in a huge and cascading 20” rain shower head. It really depends on your preference for the overall look and how large of a shower head you need to feel completely immersed. Typically the square rain shower heads will offer a few more water channel nozzles and be a little more spread around than a round shower head. The square rain shower heads also offer a luxurious and modern feel to them since most shower heads tend to be round. ​The size of your shower will help you decide on how large your rain shower head should be. You will want the rain fall to cover a decent amount of your shower, but you will also want a good amount of space that allows you to step away from the flowing water so that you can lather up. ​When it comes to finding best rain shower head, price will be a factor. The price is not always the deciding factor, since some companies will drive up the price of a standard shower head just because of a name brand. You are looking at paying around $40-80 for a nice rain shower head. This price range covers nice rain shower heads that are simple up to more advanced options that offer an additional handheld shower head. Make sure that you are taking the time to read over the reviews before you commit to purchasing a shower head online. These are extremely helpful with letting you know how the shower head was received, installed and if it has held up over a period of time. ​The simpler rain shower heads will offer a limited water flow option. Where as the more expensive rain shower heads come with built in options that allow you to change the flow, speed and circumference of the water that is flowing. You will get more water control options when you factor in a separate handheld shower head that will usually offer anywhere from two to six different water spraying patterns. While having options is always great, if you are low maintenance in the shower, then a simple rainfall shower head may be all that you need. However, if you normally change up the shower’s water flow settings to fit your mood or needs in the morning, then paying a little extra for more options would benefit you much more. ​When it comes to choosing best rain shower head you want to make sure that you are getting a shower head that is going to last you for many years. The first thing you will want to look at is the warranty and what does it cover. Some warranties can be for a lifetime but don’t cover all of the parts that can break or malfunction. Other warranties can be a shorter protection time that covers the entire shower head with a hassle free guarantee. Most of the available finishes offered like chrome and brushed nickel are well known for being very versatile and durable materials. Two of the most popular and widely available finishes are chrome and brushed nickel. Both of these finishes are great and will be equally durable. However, there are a few things to notate when you are looking for the best overall durability for your future rain shower head. ​​This bright and mirror like finish will add a touch of modernistic flair to any bathroom and matches well with most accessories and other bathroom hardware. Chrome is also a very durable material and finish that won’t chip or break. ​The downside to this finish is that chrome will show fingerprints and smudges more easily. The super smooth mirror like finish is also more prone to scratches. Any scratches or nicks on chrome will be more visible than it will be on most other finishes. ​This is the more durable finish of the two and will keep it’s original finished look for longer than chrome will. Due to the duller finish it will not show smudges, water spots or fingerprints. Brushed Nickel also matches well with most other decor and finishes. The only real downside to this finish is that it tends to get lost in the decor if you use it with a lot of stainless steel surroundings and hardware. ​There are many different styles of shower heads on the market. You should be able to find a great shower head that matches your preference and your faucet. When it comes to matching styles, you will want to match brushed nickel bathroom hardware with a brushed nickel rain shower head or chrome with chrome. Choosing a round, rectangle or square shower head shouldn’t be too much of a stretch when it comes to matching the styles of your bathroom and shower faucet. If you do find the perfect rain shower head and it does not match your current bathroom hardware, then you can switch out the previous shower valves for new ones that update the look of you shower and better match your new shower head. This DIY project isn’t too difficult and you should be able to tackle it without having to hire a professional. Just make sure that you read over all of the steps to make sure you can do it all before you begin ripping out any shower valves. ​You may not consider what you will need to properly mount a rain shower head when you are upgrading your standard shower head. ​Standard shower arms come out from the wall and angle downwards at a 30 degree angle. Some rain shower heads offer a pivoting feature that allows the shower head to be adjusted up some or down. While this feature is great for allowing you to find the perfect angle for your new shower head, rain shower heads really need to be on a shower arm that comes out and down at a sharp 90 degree angle. This allows the rain shower head to be positioned at the optimal directly downward angle that gives the user the feeling of being caught in the rain. ​You can opt to use a short shower arm that positions the rain shower head off the wall a few inches or use an extended shower arm that will position your shower head closer to the middle of the shower. ​The best ceiling mounted rain shower head is one that has a large overall faceplate and plenty of water spray nozzles, so that you are able to step into and under a large cascading rain fall. If you want to reroute your shower arm from the wall and have it come into the shower from over the ceiling, then you can do that. Depending on your DIY skills, you should be able to handle the task without having to hire a plumber. Take a few minutes to swing by your local home improvement store and speak to a specialist in the bath and plumbing section. They can give you more in-depth details about the task and help you decide if this is a DIY project that you can handle alone. ​When it comes to finding the best rain shower head and then installing it, always make sure that you take the time to turn the water off. This will give you peace of mind while your shower pipes are open and save you from any potential flooding messes.